Synopsis: Across America and around the world, the five love languages have revitalized relationships and saved marriages from the brink of disaster. Can they also help individuals, couples, and families cope with the devastating diagnosis of Alzheimer's disease (AD)? About Gary Chapman: (Note: there was no info available on the other authors at the time this was posted). Gary Chapman has traveled extensively around the world challenging couples to pursue healthy, growing marriages. His first book, Toward a Growing Marriage (Moody, 1979, 1996), began as an informal resource he gave to couples with whom he was counseling. Once officially published, this book became a blessing to thousands of people and helped launch Gary’s popular “Toward a Growing Marriage” seminar. Since 1979, Gary has written more than 20 books. His book, The Five Love Languages (Northfield Publishing, 1992, 1993), has sold 4 million copies in English alone and has been translated into 36 languages including Arabic and Hindi. He has also appeared on several television and radio programs and has his own daily radio program called “A Love Language Minute ” that can be heard on more than 100 radio stations across the United States. In addition to his busy writing and seminar schedule, Gary Chapman is a senior associate pastor at Calvary Baptist Church in Winston-Salem, North Carolina, where he has served for 36 years. Gary and his wife, Karolyn, have been married for 45 years, have two adult children, and two grandchildren. Gary Chapman is a graduate of Moody Bible Institute and holds B.A. and M.A. degrees in anthropology from Wheaton College and Wake Forest University, respectively. He received M.R.E. and Ph.D. degrees from Southwestern Baptist Theological Seminary and has completed postgraduate work at the University of North Carolina at Greensboro and Duke University. Review: I originally chose this book because I'm still struggling with my own past experience with my grandmother's alzheimer's, and watching my family change as they tried to cope. I finally feel like I have understanding and closure. I also feel like I am more prepared to deal with it should it ever enter my life again. 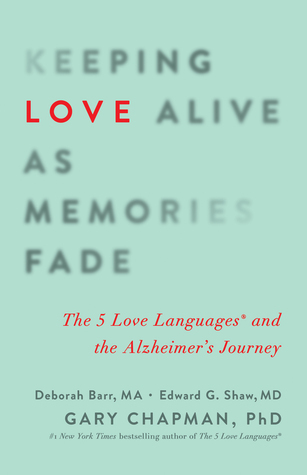 If alzheimer's has touched your life, past or present, or dementia is, I urge you to read this book.